This post is supposed to be pure fun. Some of my faithful readers will not agree, since they don't like bugs or salamanders. Consider yourself warned. 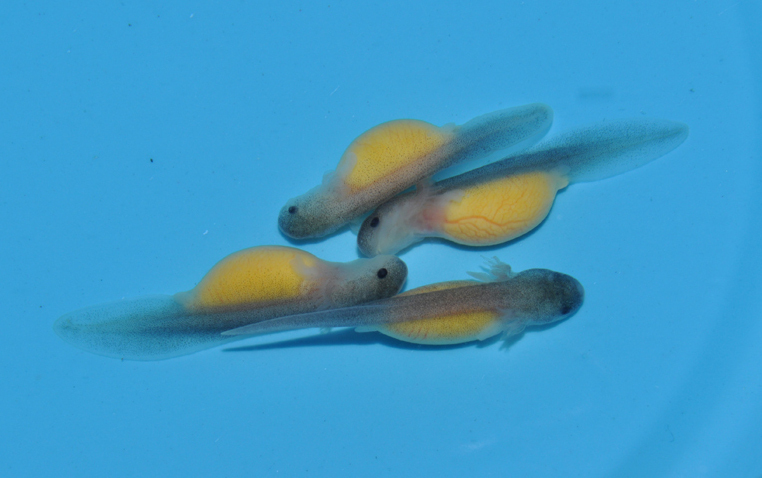 A recent press release from the St. Louis Zoo announced their success at captive breeding of hellbender salamanders (see the larvae at left, photo courtesy St. Louis Zoo). Aren't they adorable!? For those unfamiliar with hellbenders, they're the biggest salamanders on this continent. They can grow up to two feet long. The Ozark subspecies of hellbender has experienced a rapid decline in recent years, and the work at St. Louis is the first time hellbenders have been bred in captivity. See the full press release for more details. Meanwhile, from New Zealand comes the report of a living wetapunga, a giant grasshopper-looking bug native to Little Barrier Island, off the coast of the North Island. Wetapungas have been in decline for some time due to rat predation, so it was kind of a big deal to find one still alive. Check out the really awesome photos at The Sun, but be warned: If you don't like the idea of a grasshopper as big as your hand, you might not want to see the pictures. UPDATE: According to this New Zealand webpage, wetapungas aren't all that rare on Little Barrier Island, nor is the pictured specimen all that large (compared to others of the same subspecies). I guess I should know better than to take The Sun's word for it.